I absolutely live the quilt, shams and throw pillow! My bed looks just like a magazine layout!! Not too heavy but plenty cozy. 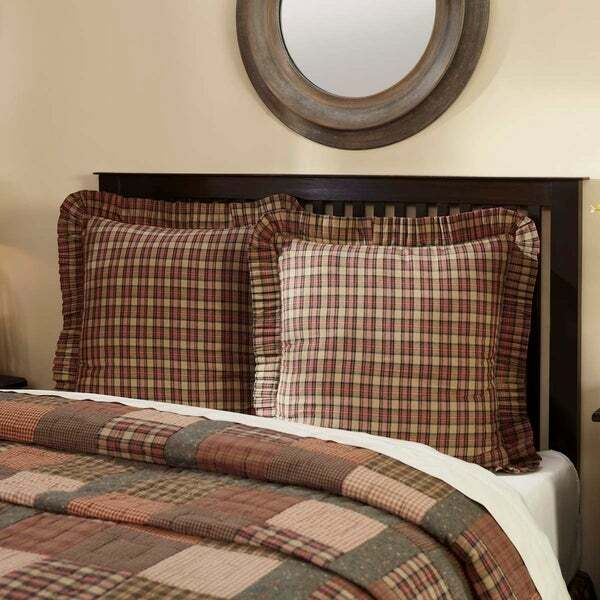 The Crosswoods Fabric Euro Sham matches a tan, blue, green, and red plaid found in the quilt patchwork and adds balance to beds with the Standard and Luxury Shams. 100% cotton, trimmed with self-pleated ruffles. I’m thrilled with these beautiful shams and the entire Crosswoods ensemble! Each piece was perfectly represented on the Overstock website in terms of color and quality, they were delivered promptly, the quality is outstanding, and the price was super reasonable. The set looks smashing in our bedroom! I love the colors and the material is good quality😊😊very fast shipping. Highly recommend. Goes perfect with my primitive decor.. the colors are much prettier than the picture. I really liked these, i returned them , just wish they were smaller I'd definitely kept them. Really made the bed look nice. Very well made, nice size.